Preheat oven to 350F. Grease and line four 6x3 round pan. Set aside. Cream butter until soft. Add in sugar and beat until light and fluffy. Add egg yolks, one time at a time, beating well after each addition. Sift the flour, baking powder and salt together. Add to the creamed mixture alternately with combined vanilla and milk. Blend well. Bake for 40 to 45 mins or until done. Let it cool. Chill in the refrigerator. In a double boiler, simmer whipping cream. Pour chocolate chips and mix until melted. Remove from heat. Let it cool. Set aside until ready to use. Cut off the cake’s dome portion, then cut the cakes in half. Place one cake layer on a base. Pipe Italian meringue buttercream and place another cake layer, do the same in between the cake layers. Cover the whole cake with the buttercream. Place three to four pieces of skewer at inside the cake for support. Place ganache in a piping bag and start piping around the edges of the cake to get the “drip” effect. 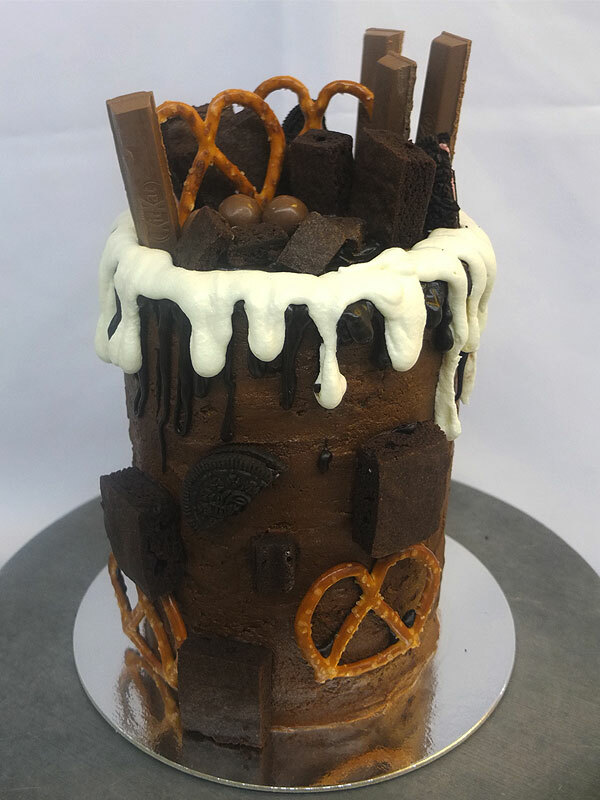 Decorate the top and sides of the cake with pretzels, chocolate sticks, chocolate malt balls and brownies.